Much loved kiwi troubadour Monty Bevins hits the road this May and June to celebrate the release of his new single Lovers Again. 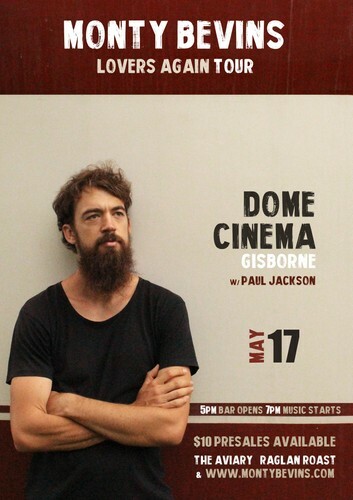 He'll perform in the beautiful Dome Room at Gisborne's Dome Cinema, with support from local singer/songwriter Paul Jackson. $10 presales available from The Aviary, Raglan Roast. Lovers Again was a song I wrote about on an older couple I met in Arthurs Pass whose three girls have all since moved out into the world, leaving Mum and Dad at home in a big house in Woodstock (Canterbury). May 17 with Paul Jackson. Press Enquiries: montygig@gmail.com or 027 465 9034.